The Reliable 5000CD Dental Steam Cleaner has been designed from the ground up to deliver superior quality dry steam, and provide the best possible user experience. The 5000CD offers a quick, efficient way of cleaning away wax, plaster waste and other debris, and for polishing the final product. Features: i37 steam gun, automatic shut-off - with low water light indicator , regular tap water, pressure gauge manometer, 50 p.s.i. 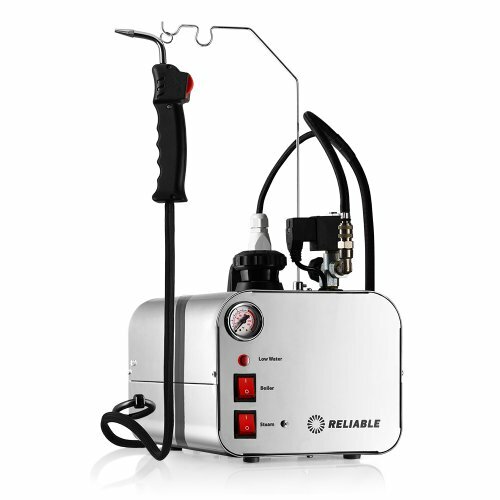 operating pressureequals dry steam, 12-gauge heavy-duty wiring, ceramic terminal block, stainless steel tank and outer casing, quick disconnect fittings for steam hose (5000CD model only), 4-pin (quick disconnect) plug for electrical connection, up to 4-hours of continuous steam. Measures 9-1/4 by 16 by 10-1/2 inches. Lifetime product warranty policy applies to all Reliable Corporation pressurized steam boiler tanks. See warranty document for details. Uses regular tap water; manometer pressure gauge; operating pressure of 50 p.s.i. If you have any questions about this product by Reliable, contact us by completing and submitting the form below. If you are looking for a specif part number, please include it with your message.